Francis Berringer is a minor cog in a corporate machine. His girlfriend just left him. He can’t tie his tie straight. His life takes a sudden turn when he’s running late for work one morning and stumbles across a suitcase full of women’s clothes and an odd business card with only an email address on it. He knows he shouldn’t get involved but can’t resist. He sends a message to the email address and arranges the return of the suitcase. The way Francis’ life is going, he could use a little karma, so why not do a good deed? And then the girl shows up, a slender good looking blond, nose ring, tattoos, bomber jacket, army boots, and all. Berringer is intrigued by the attractive stranger and soon finds himself dodging bullets and doing his best to stay alive, wishing he’d never bothered with that suitcase in the first place. A muscle car, automatic pistols, and a girl with a secret. Francis doesn’t have a lot of experience with these things, and all he knows is that the bad guys are after him and the good guys are, too. Victor Gischler’s writing spans multiple genres—crime thrillers, satirical science fiction, and epic fantasy. Gischler’s debut novel Gun Monkeys (2001, Dell) was nominated for the Edgar Award, and his novel Shotgun Opera (2006, Dell) was an Anthony Award finalist. No Good Deed tells the story of a regular guy who tries to do the right thing but finds himself in an unexpected situation. Who doesn't root for a down-on-his-luck, reluctant good guy protagonist who’s unwittingly mixed up in a mystery? 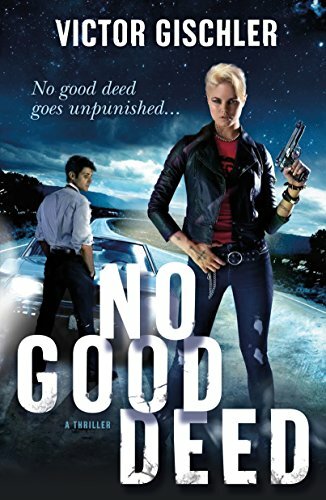 Toss in a good-looking woman who’s filled with secrets, throw in a gang of criminal hooligans, and a cold-hearted antagonist government agent and you’ve got the recipe for a fun and rewarding read. Overall, Gischler’s writing style is fast-paced, humorous, and loaded with thrills and chills. The plotline is dynamic and chock full of edge of your seat surprises. This gripping, free-wheeling joy ride of a whodunnit invariably leaves the reader unabashedly cheering for the heroes and jeering the villains.